Since I'm still helping my parents send my youngest brother to school, part of my writing income goes to his college tuition. However, every December, I make it a point to reward myself for all my writing efforts. Last year, I was able to save some money to buy my very first oven. 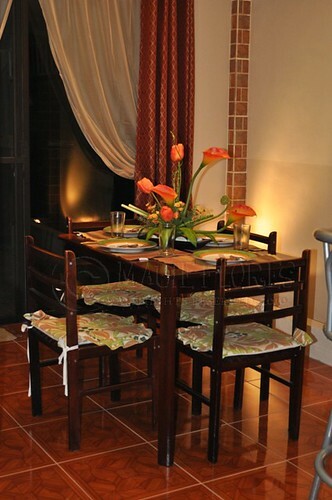 This year, with the peso-dollar exchange rate not freelancer-friendly, I'm just thinking of buying a new dining table for our home. See how "cute" our dining table is. It's now common for me to witness my boys bickering about the lack of space when we're having our meals together. The chairs seem to be wobbling too since the wood pieces are just held by screws and pegs. The whole dining set needs replacing so to speak. I still need a month or two before my new dining set fund is enough for me to take a trip to Mandaue Foam. I hope they still have modern dining tables on sale there.